Florencio Sanchidrián, Spain´s greatest cortador de jamones, demonstrates his unique style of cutting Jamón Ibérico de Bellota at his restaurant, Rincón de Jabugo in Ávila. Photo Gerry Dawes©2015. 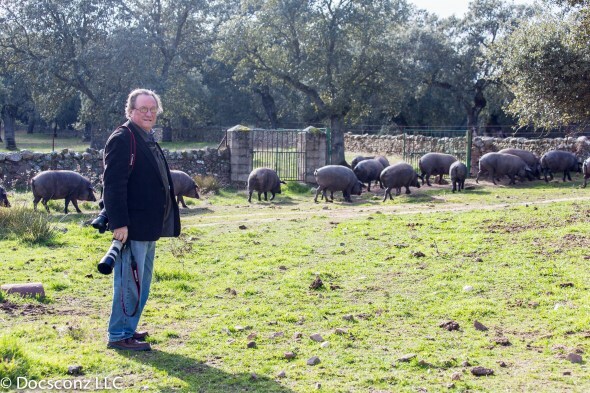 Gerry Dawes with Ibérico pigs in La Dehesa de Extremadura. John Sconzo and his son, L. J. on a hill overlooking Segovia's famous Alcázar and Cathedral on our pilot trip for out November Pig Tour of Spain. 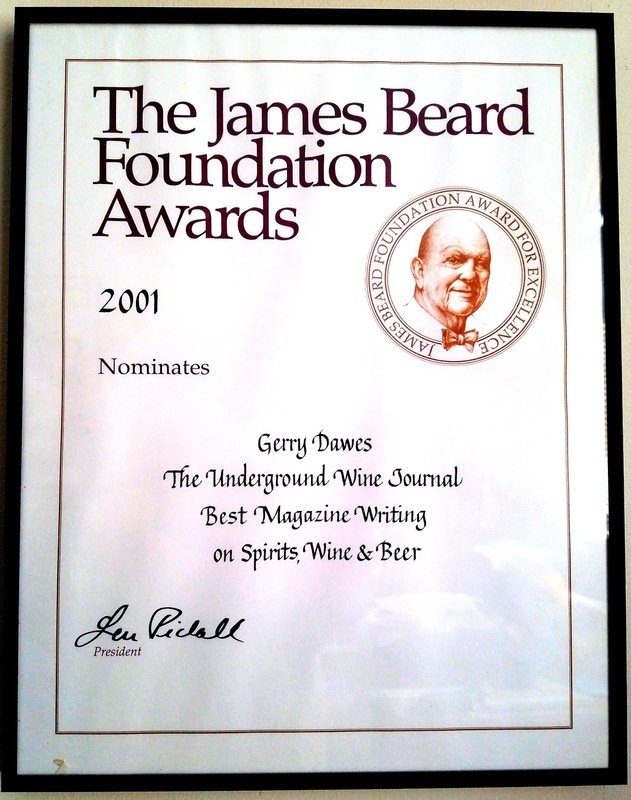 Photo by Gerry Dawes©2014. 2000-year old Roman aqueduct at Segovia. Photo by Gerry Dawes©2014. Kay Balun, John Sconzo and L. J. Sconzo with cochinillo, roast suckling pig, at Mesón del Candido, Segovia. Photo by GerryDawes©2014. Day 00, Wed., Nov. 9 USA to Madrid Flights to Madrid. Arrive in Madrid, Spain's capital, where we will rendezvous at our hotel, which will be near the Prado Museum. 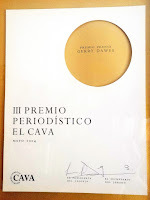 We will allow everyone to rest and freshen up, then we will meet at 2 p.m. for lunch at a restaurant owned by Spain’s greatest cortador de jamones, Ibérico ham cutter-he travels the world showing how these hams should be cut-and sample the best jamón, personally selected by this superstar personality. This will be our first introduction to jamón Ibérico, the world's best hams from acorn-fed, pata negra (black foot breed) pigs. The woman chef, mother of the cortador’s restaurant partner is a great traditional cuisine cook, so jamón will just be the intro to our meal. After lunch, we will visit the Prado Museum with a professional guide. 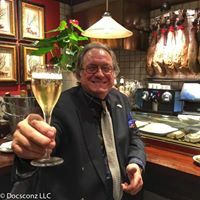 In the evening, we will visit a couple of very special places for drinks and tapas, then have dinner at one of John Sconzo’s new discoveries in Madrid, La Buena Vida. 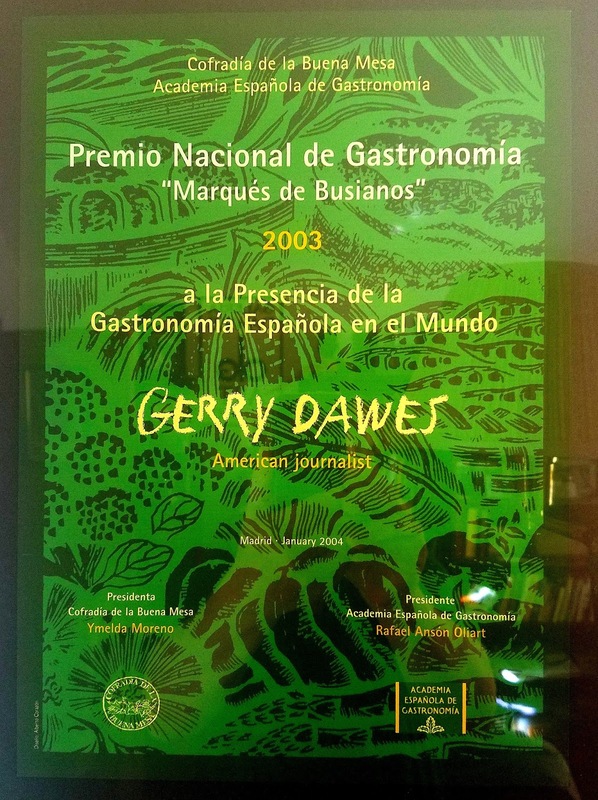 From Madrid, we will drive up into the Guadarrama Mountains to Segovia, the roast suckling pig capital of Spain and home to an amazing 2,000-year old Roman aqueduct that still crosses the city. For lunch, we will have exceptional cochinillo, roast suckling pig, so it can be cut it with the edge of a plate, in a restaurant that has been a must visit for celebrities and just plain folks for decades. Day 03, Sat, Nov. 12 Salamanca – Guijuelo – Hervás – Casar de Cáceres – Cáceres – Trujillo 218 kms. 3 hrs. We will spend a little time in the morning seeing some of Salamanca and visiting the market, then head south through the major pig town of Guijuelo, where we will stop to visit one of Spain's top jamon Ibérico producers, then travel south, stopping off to visit historic Hervas (an old Jewish town), arriving in to the monumental medieval city of Cáceres, where we will have lunch and sample the sensational local Torta del Casar and Torta de la Serena ewe’s milk cheeses. After lunch we will take a walking tour the old quarter of Cáceres, before moving on to the important nearby hilltop town of Trujillo, hometown of Pizarro (conqueror of the Incas) and Orellana (the first European to make the 2400-mile trip down the Amazon). Trujillo has a major cheese fair every year in May and producers here make great goat cheeses, including Ibores. In Trujillo, we will take a break from pig and have some roast goat and try other regional specialties. We will stay in a lovely converted palace on the main plaza in Mérida (excellent evening lollygagging territory) and within an easy stroll of all the major Roman ruins. This afternoon will be free to relax, tour the Roman monuments, stroll across the river on a pedestrian-only Roman bridge and in a nearby restaurant sample grilled cuts of pork from Ibérico pigs. We will leave Merida in the morning, stopping off for visit to a farm that produces foie gras by natural, not by gavage (forced feeding) methods (Chef Dan Barber has written about this place), then make a short visit to Jerez de los Caballeros, the evocative and picturesque hometown of Vasco Nuñez de Balboa (discoverer of the Pacific Ocean) and De Soto (explorer of the Mississippi River). By lunchtime, we will arrive in Jabugo, the jamón Ibérico capital of the Andalucía. We will tour a jamón processing plant and have lunch there on some of the best pig products in the world. After lunch, we will arrive in Sevilla, the city of Carmen and one of the most beautiful and evocative cities in Europe. After checking into our hotel, we can relax until early evening when Gerry Dawes will lead a walking tour of this stunningly pretty city where he lived for nearly six years. We will sample tapas in a few places, then sit down in a particularly good tapas bar for some grilled shrimp, fried fish (an Andalucian specialty) and other special tapas, including, no doubt, a plate or two of Ibérico ham. After the tapas tour, there will be the option of going with some native Sevillanos to an authentic flamenco joint. In the morning, we will have a guided tour of the Cathedral and the Moorish fortress-palace El Alcázar, the Barrio de Santa Cruz (the old Jewish quarter), do some strolling and shopping, then travel south to the superb fishing and Sherry town of Sanlúcar de Barrameda, where Columbus set sail on his second voyage to America. 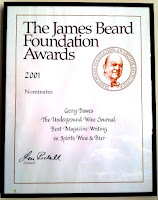 We will prevail upon one of Gerry’s friends to open his old sherry bodega and let us taste some of his exceptional manzanilla sherries, then we will have lunch at a beachfront restaurant with more manzanilla, grilled shellfish and some of the best fried fish in the world. Hopefully, we will see one of Sanlucar's spectacular sunsets from the legendary Bajo de Guia fisherman's beach with a glass of manzanilla in hand (more on this later). In the evening, we will have free time to enjoy the Plaza del Cabildo and environs, which has some of the best tapas bars and restaurants in Spain. Day 07 Wed, Nov. 16 Sanlúcar de Barrameda – Cádiz – El Puerto de Sta. Maria - Sanlúcar de Barrameda 2 hours bus and ferry, round trip. Market breakfast in Sanlúcar market, then to El Puerto de Santa María, where we will visit and taste in another Sherry bodega, then get the ferry to Cádiz in the morning, visit this wonderful sea-surrounded peninsular city and its unique market, have lunch in Cádiz, then back to El Puerto by ferry. We will return to Sanlúcar de Barrameda, a 20-minute ride, then have a free, relaxing afternoon, before we return to El Puerto de Santa María at the sensational Aponiente Restaurante, where Chef Angel León is doing some of the most creative, innovative seafood based dishes anywhwere. We will return to Sanlúcar for an optional nightcap and a relatively early (for Spain) end to the evening. Day 08 Thurs, Nov. 17 Sanlúcar de Barrameda – Pueblos Blancos – Ronda – Córdoba 350 kms. 4 ½ hrs. with several stops. We will leave Sanlúcar in the morning and drive east through the spectacular Pueblos Blancos, the white hilltop villages of Cádiz and Málaga provinces, some of which are cheese villages, visit a great mountain cheese producer, then have lunch in the spectacular city of Ronda, which is set astride a 300-foot gorge that splits the town in two. After lunch, we will take a brief walking tour of Ronda, then drive to Córdoba, where we will tour the Mezquita (once one of the great Mosques in the world, which is so huge that it has the Christian full-sized cathedral built into the middle of it) and the Roman bridge. We will wander the labyrinthine streets of the old the old Jewish and Moorish quarters, one of Spain's finest old quarters, have some free time for shopping. In the evening, we will gather in the lobby of or hotel, then take a short walk to a very special Cordoban taberna, where we will have fried eggplant strips along with two kinds of salmorejo (a thick gazpacho that is at its best here). 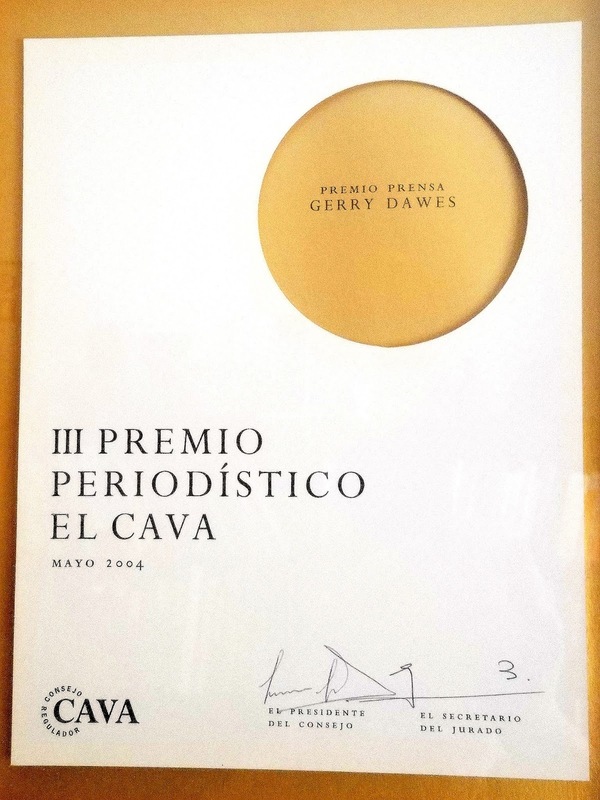 We will also sample the excellent jamón Ibérico from the up-and-coming Pedroches ham region north of Córdoba, then move to another colorful local restaurant for some churrasco (grilled pork loin) or steaks and some good red vinos. In the morning, we will tour more of Córdoba, relax a bit, then have an early lunch at Chef Paco Morales’s Noor, which specializes in modernized dishes based on Hispano-Moorish tradition drawn from Córdoba’s illustrious past as one of the great capitals of the Moorish world (rivaling Damascus). After lunch, we will ride via La Mancha, land of Don Quixote, stopping briefly for refreshments at Puerto Lapice (where Quixote spent a night guarding his armor and refreshments and at Consuegra (ridge-top castle and a dozen windmills) and end up in the historic city of Toledo. In Toledo, we will visit El Cigarral de Santa María, which has spectacular views over the properties on vineyards, olive trees and the city of Toledo below. The owner, whom Gerry calls the Emperor of Toledo is a major chef-restaurateur. After the visit, we will check into our hotel, then take a walking tour of old Toledo, have some free time, and gather for a creative tapas dinner at Colección Adolfo, the Cigarral owner’s tapas restaurant near the Cathedral and we will visit his restaurant group’s magnificent wine cellar underneath what was a Jewish home in the 9th century. Day 10, Sat, Nov. 19 Toledo – Aranjuez - Chinchón 70 kms. We will take a guided tour of Toledo in the morning, visit the historic home of the great painter, el Greco, the two great synagogues and the Cathedral, then ride 30 minutes to Aranjuez, where we will lunch in one of the top restaurants of the region. 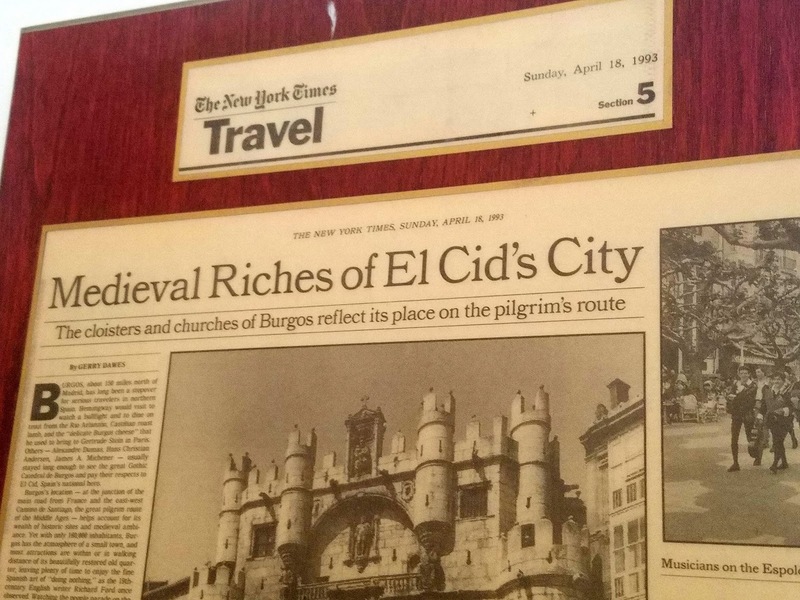 After lunch, we will ride another 25 minutes to the enchanting city of Chinchón, where we will check into a charming hotel just a block from Chinchón's legendary Plaza Mayor, one of Spain's best restored and loveliest plazas, which is like a page out of the 16th Century. Our group will have the rest of the afternoon free to explore this magical village and shop for unique local items. We will have dinner at La Balconada overlooking the charming Plaza Mayor. At this romantic restaurant, Chef Manuela and her husband Isidro, offer superb classic Castillian dishes, including more pig (roasted) of course, but with the option of having roast lamb, wood-grilled steaks, bean dishes, fried potatoes with "broken eggs," artichokes cooked with jamón Ibérico bits, bean dishes and other specialties, accompanied by simple D.O. Madrid (province) Rosado and red wines. We can linger over snifters of the town's famous Anis Chinchón licor (dry or sweet), watch the peregrinations of the people down in the plaza and reminisce about the high points and comedic episodes of our trip around Spain. 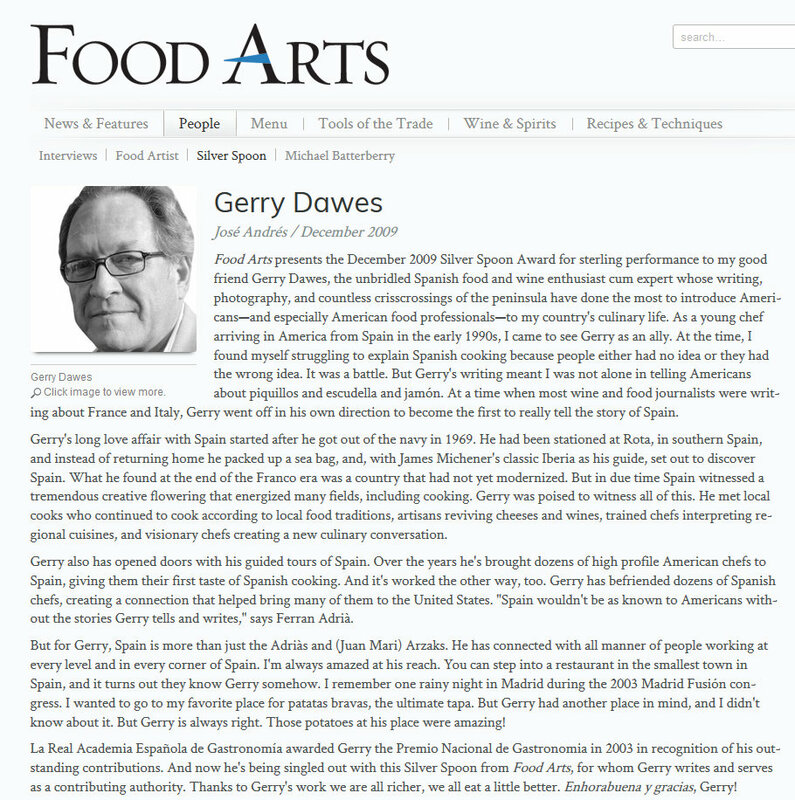 Gerry Dawes is the Founder-President & Jefe of The Spanish Artisan Wine & Spirits Group - Gerry Dawes Selections, representing some of the finest small artisan grower-producers in Spain.